Sometime ago, I reported to my GM that /effect does not switch off the visual effects on Blindness as it should be on official servers. His reply was simply, "Its a client related thing. Nothing we can do about it." Well, he was correct. If the GM is unable to do anything about it, then it's up to you to fix the bug and edit the client side. 1. If you don't have a program to extract .zip file (winzip or winrar will do it), download and install the program below. 2. Download the necessary files (fullb.tga and white02.bmp in the .zip or .grf) from attachment section of this post. 5. 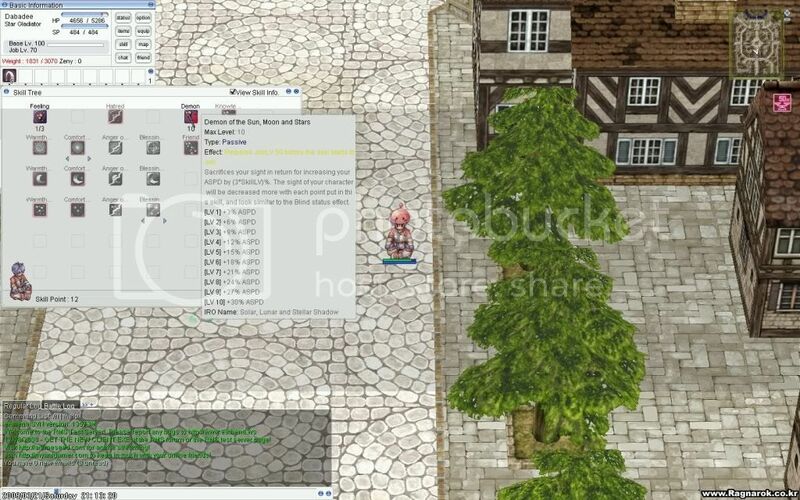 Just load RO, and you will be immune to the visual effects of Blind on your screen only. When affected by Blind status, your HIT and FLEE rate will continue to be reduced by 25%; however your range of visibility will not be affected due to the modification. If you are from a TYPE III Server. I pre-made blind.grf which can be downloaded (see attachment). Simply edit your data.ini file and ensure that blind.grf takes priority over other grfs. It appears, this edit might disable the "visual timer effects" indicator shown next to the effects icons found on the top right of the screen on some servers. Hehe, this works perfectly, and it helps a little. But it was nice to know that you *were* blind. Ahh this is a nice modification. Thanks for the guide! By the way your uploading.com always show me as having exceeded my download limit for the day (even though I didn't download anything from it). Is there any other upload sites that you've uploaded this zip file into? 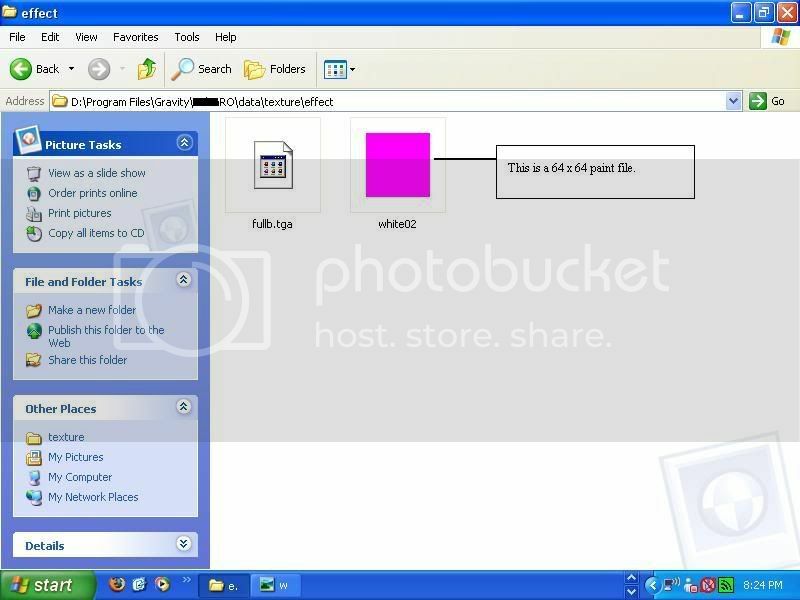 If not do you mind teaching us how to create the 2 files that you showed in your screenshot? Not sure if I've done it correctly but I've created white02 using paint, size 256 x 256, with it filled as the "hot pink" colour. I have no idea how to create a fullb.tga file though. I swear those were put in for a reason. I have no idea how to create a fullb.tga file though. MS Paint does not read .tga files. 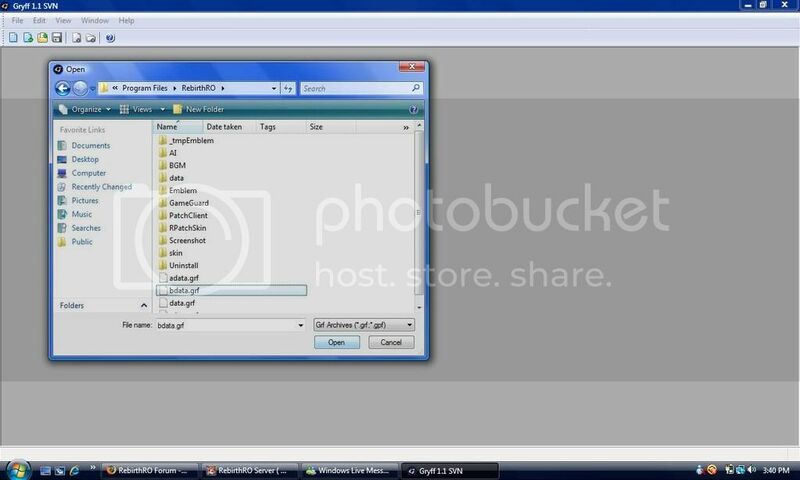 Take the white02.bmp file which you have just created and Copy and Rename it to fullb.tga using Windows Explorer. That should work. Thanks bleu. I'll try to follow what you say and create the 2 files. Not everybody is blessed to have a blazing fast comp. Blindness can lag up a Client on older PCs, moreso than Hallucination effect(which is an instant lockup for any comp that dwells near the minimum requirements). What Bleu did was smart, isolate the problem and fix it. If /effect doesn't work, you make your own fix. Just because his Client isn't black and laggy doesn't mean he isn't suffering the effects of it(stats or otherwise). Hold on... Something's wrong. Blind.rar isn't a .rar file, it's an .html file (takes you back to that download page). Might wana edit that, thanks. I tried to do this, created the folder you said to, and then created a folder inside my RO directory under Data. This has not worked for me. Could anyone possibly add anything I might check that I'm doing wrong? I can give this a shot when I have some spare time and post my results, the only issue currently is that my Client(custom DIFF'd X-Ray) that I used to use for SolsticeRO disabled "Blind" graphic effect via /effect and the "Hallucination" was completely disabled via the DIFF. Bleu, if you can toss me a link to the Client you use for your server, I can try it out from there. Click on the link provided above. Then click on "Download file"
Could u be more specific on what you have done so far? And some screenshots would help. "We have switched to a new encryption scheme for the client. If you do not patch up, you will not be able to connect." There has also been other reports that after the new RebirthRO patch, the Blind Effect Edit was no longer working. May I suggest you contact Juan and SLLOSHY from RebirthRO (Loki). They should be able to assist. Well I was able to get it to work. I've attached the screenshots below as proof. As you all can see, I'm not affected by blind effect at all. I've even shown the skill list which says that I have Level 10 Demon. Once you've downloaded the said files, put them into your ragnarok > data > texture > effect folder. For those of you who tried to create the 2 files by yourself because of the problems when downloading form uploading.com, re-download the 2 files and replace your own creations. Once done, restart your client to "see clearly" again Hope it works for you all just like it did for me. Just hope you all get banned for using this guy cheats.